We are always looking and accepting applications from friendly and hardworking people who want to join the Cosmic Nation team! 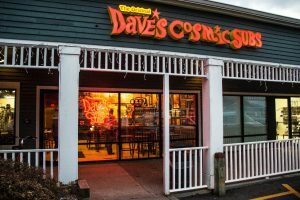 Nestled between the Green Mountains and Lake Champlain, South Burlington, Vermont is a special place and special places deserve to have a Dave’s Cosmic Subs. We fell in love with Dave’s Cosmic Subs from the first delicious bite and knew that Vermont was THE groovy spot to be! We hope that you feel the same way…from the moment you step in and are immersed in the rock n’ roll culture, look at every iconic picture and remember that life IS easy and rock ‘n’ roll IS cool. We hope you stop in and see us today and you fall in love with everything about the Cosmic Nation!